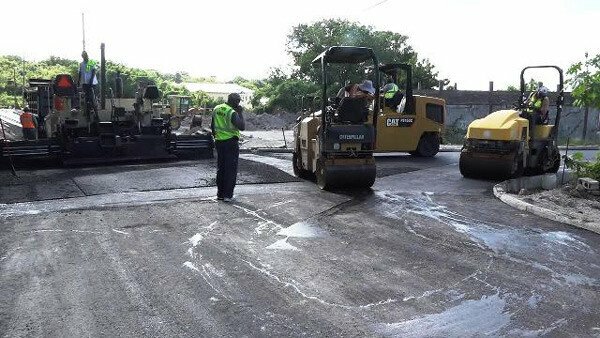 The Nevis Island Administration (NIA), is continuing its trust to ensure the continued upgrade of the road network on Nevis. The Braziers Road Improvement Project, about 12,000 feet of road way, is the most recent road initiative to be completed after 10 months of construction. Hon. Troy Liburd, Junior Minister in the Ministry of Communication and Works, spoke of the project on November 15, 2017, as he witnessed asphalting of the final section of the road in the Marion Heights area, which marked the end of the project. â€œThe good folks at Public Works, commenced work on the Braziers Road project up in the area of Church Ground where you use to have that really bad road that linked Church Ground to Braziers. Very few people would have traveled that road. â€œThat has been paved for some months now and now, we are seeing the final bit of paving to complete this set of roads. In all, we have done just over 12,000 feet of road here in Braziers and [the] people will have a brand new paved road to getâ€¦from Braziers all the way up to Church Ground,â€ he said. The minister, thanked the residents in the area for their patience during the road construction. He said, one resident from the area registered their contentment with the project, since they had lived in the area and had waited for about 40 years for that type of development. Mr. Liburd, registered satisfaction with the Director and staff of the Public Works Department and the Manager and staff of Nevis Water Department for spearheading the project along with Mr. Ernie Stapleton, Permanent Secretary in the Ministry of Communications and Works and Mr. Denzil Stanley, Assistant Secretary in the ministry who, along with him, planned and executed the project. The minister use the opportunity to underscore the use of locally owned equipment, services and expertise throughout the project. He said the government had taken a bold decision to empower the Public Works Department, the Nevis Water Department in addition to local contractors and had invested in equipment, to ensure they had all that is necessary to execute projects of that nature. Mr Liburd said he was pleased that the NIA had made the investment and it is now seeing the fruits of that undertaking.